I have a very good friend Rosa, who I've been in touch with since we were 14 years old. She's "from the old neighborhood." We have so much history together. We use to walk to school together, our brothers use to play/fight together. My family let me bring her on camping trips with us, so we go way-back. When ever I've visited the Chicago area I always call up Rosa and ask to visit/stay with her. The answer is always, "Yeah, come on over!" When we were planning this trip, Rosa was one of the first people I called. After we left Lake Zurich last week, we went straight to Rosa's and were there for 5.5 days. She took me to her aquatic class. Rosa, Dave and I went to the movies and we hooked up with two other school friends for dinner. It was like "being home." It's been so relaxing and fun at the same time. On Thursday, Dave and I did some sight seeing. We went to Millennium Park to see the Cloud Gate "Bean," the Marilyn Monroe exhibit on Michigan Avenue, then walked over to Navy Pier. The weather was so beautiful, cool, and windy. Perfect jacket weather. That same night we met up with two other school friends for dinner. It was really great to spend the time together. We did some reminiscing and had some laughs. Don't know when I'll see them again, but we'll pickup where we left off. On Saturday, we met up with an online buddy of Dave's, he's been talking online to this buddy for about four years. We met his wife, son and daughter, really nice family. Dave was really happy to finally meet him. We spent the day with his friend and his wife. They took us to the Morton Arboretum, had a little snack, walked on some of the trails, look lots of photos, then went to dinner. Another perfect day. On Sunday, we met up with some of my cousins and an uncle I hadn't seen in over 40 years. We had so much fun! They finally got to meet Dave, I got to meet some of the cousin's children. We were all making up for lost time. I also got to close up some genealogy gaps in my research, always a good thing! We swapped cell phone numbers, email addresses and took group pictures. They even hooked me up with a collateral cousin down in New Orleans, LA where my "brick wall" family lives! What a great visit. Today, we had to say good-bye to Rosa and Chicago. We made our way to Ft Wayne, IN and the Allen County Public Library to do some research tomorrow. 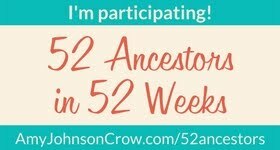 Keep your fingers crossed for me, maybe I'll be doing the genealogy "happy dance" tomorrow night.